Woodstock Soapstone Co. Blog: Hot Dogs! 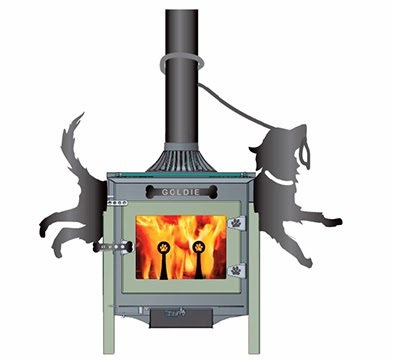 We’ve had some requests for Dog Trophy Stoves, and the illustrations below are ruff rough, but will hopefully give our dog-lovers some ideas. We’ll have some finished Dog Trophy Stoves next week, along with maybe a Trophy Stove Genie. Lorin is working on our design book, which we hope to make available before the end of December, so you can see all of our design variations in one place any time! 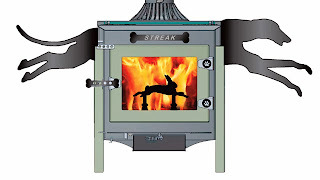 What we call “trophy stoves” are stoves using the space above and to the sides of the firebox for design and ornamentation, in addition to our customized options for fenders, cooktops and andirons. The Ideal Steel Hybrid has attachments built in to make it easy to create trophy stoves. This model has dog bone andirons, latch, and nameplate. We aren’t sure whether to put the rabbit on the pipe, or let him hide below the ash lip on on the ash door door (above). 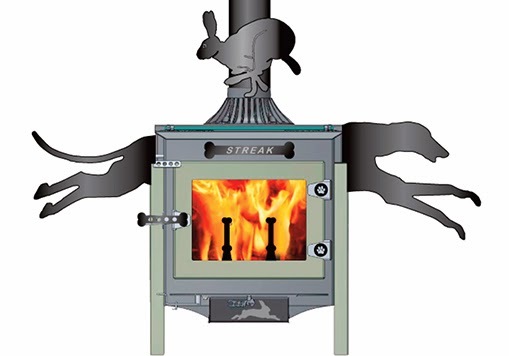 Or maybe we let the rabbit hide inside the stove, by making a rabbit andiron. Here’s a simple but fun design that’s a little artsy too! Didn’t we all have dogs named “SPOT” when we were young? The stovepipe is just there... so why not use it? 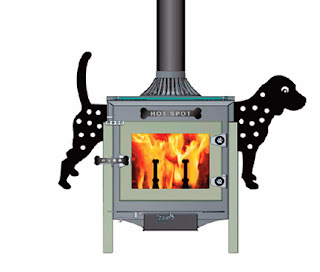 This design has pawprint andirons and hinges, and a leash that wraps around the pipe.